There is absolutely no doubt about the fact that the paratha is one of India’s favourite foods. Many Indians, especially in North India, do not mind having it for more than one meal a day! It is a good thing that many of the parathas are also suitable to carry along when travelling. Parathas made with certain fillings, cooked and packed in the right way, can stay fresh for a whole day. 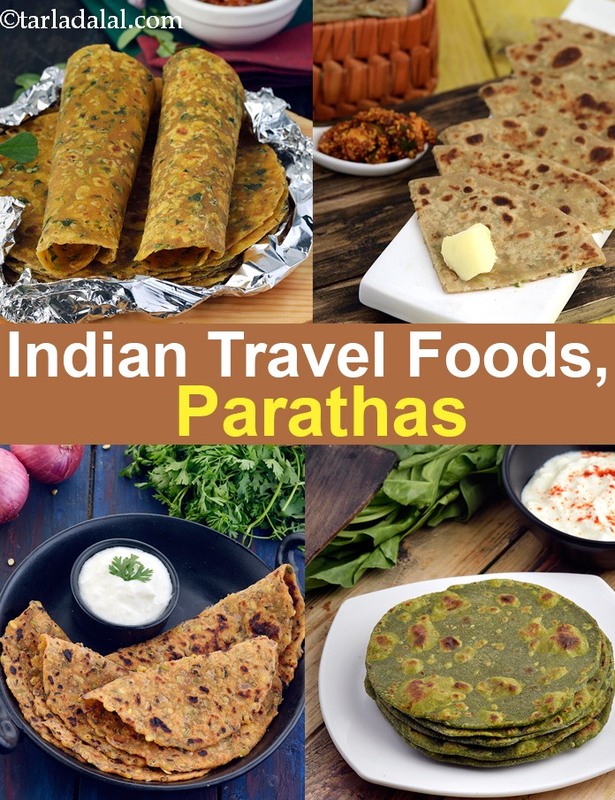 Since kids as well as adults enjoy having parathas, and it is wholesome enough to be a One Dish Meals, it is quite apt to take along while travelling. Like South Indian like to carry Idli or Chitranna Rice while travelling, most North Indians like to pack along some parathas. These days we find this geographical distinction fading, and people across the country enjoy food from other states too. So, we even find a lot of people in South India relishing yummy parathas. Here is a collection of yummy parathas that stay fresh for a day – but we suggest using them only for a day and not more than that. We have chosen relatively easy, no-fuss recipes that you can prepare comfortably before leaving, without too much stress. From evergreen recipes like Aloo Paratha and Gobi Paratha to herby, greens-loaded treats like the Methi Paratha and Pudina Paratha; regional favourites like Delhi’s Banana Paratha,; healthy treats like Moong Dal Paratha and Paneer Masoor Paratha and innovative delights like the Cheese Paratha and Paneer Spring Onion Paratha, we have collated a collection of our favourite recipes, just for you. You can take these along when you go for a picnic, for a train journey, or even on a flight if you do not want to have the food catered there. However, be careful when packing them. Firstly, you need to let them cool completely because if they are packed hot, they will sweat or release water and become soggy after a while. Once they are completely cooled, wrap the parathas is foil paper and then pack them in an airtight container. Now, your dabba full of taste, joy and goodness is all set to go into your picnic basket. The exciting flavours and fillings make these parathas a great hit with young and old alike, so you can have the pleasure of watching the whole family relish them with equal zeal! 1. Let the parathas cool. 2. Wrap in foil paper. 3. Pack in airtight container.